SK Bioscience said Wednesday that its SKY Cellflu has become the world’s fist trivalent influenza vaccine to join the World Health Organization (WHO)’s prequalification (PQ) certification list for global buyers. 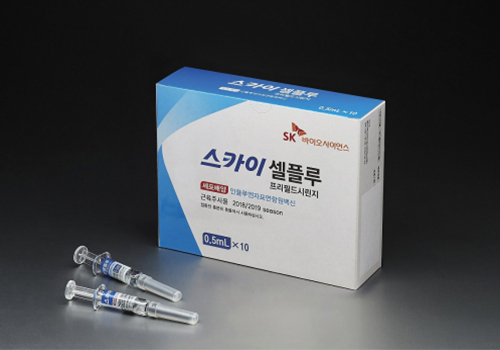 The South Korean vaccine developer, a spin-off from SK Chemicals, said the flu vaccine passed strict certification procedures that lasted for nearly 18 months. The world’s highest health policy-setting body makes prequalification evaluation on the quality, safety, efficacy and safety control of vaccines before use and supply to developing countries, and the certification indicates the vaccine meets international standards for purchase by other U.N. agencies. With the PQ certification, SK Bioscience is eligible to participate in the international relief tender organized by the Pan American Health Organization (PAHO)/WHO and UNICEF. The company said it was able to win the PQ approval in a relatively short period of time under the active support from the Ministry of Food and Drug Safety for Korean biomanufacturers. Instead of fertile eggs, a state-of-the-art aseptic culture system is used to produce the vaccine, and thereby it does not require the administration of antibiotics or preservatives. In addition, the production period is shorter than that under conventional methods, making it possible to respond to the pandemic in a faster manner. Thanks to these advantages, more than 18 million doses of SKY Cellflu were sold domestically in four years after the launch. Besides the trivalent vaccine, SK Bioscience has Sky Cellflu4, the world’s first quadrivalent flu vaccine, and shingles vaccine Sky Varicella in its portfolio.